Tested/Guaranteed • Windows 10 64 Bit Compatible • V2 Software Compatible • 5-Band Multiband AGC/Compressor/Limiter • Bare PCI Card, No Cables Included • Get The Legendary Orban Sound! Listing comprises card only. Tested for correct operation under Windows 10 64 Bit. I tested the card under the Version 2 driver software (available at the Orban FTP site - ftp://ftp.orban.com/1100) - see below. A screenshot taken during the testing of your card will be included in the package for your peace of mind. No documents, cables or accessories are included, the cable set may be purchased on line for about $110 if required. Optimod-PC tailors your audio signal to help you compete in digital audio broadcasting (DAB), Internet web/netcasting, and recording applications. Optimod-PC is a PCI Sound Card with on-board digital signal processing that's suitable for both live streaming and on-demand programming. The DSP provides a loud, consistent sound to the consumer by performing automatic gain control, equalization, multiband gain control, and peak-level control. Without Optimod-PC processing, audio can sound dull, thin, or inconsistent in any combination. Optimod-PC's multiband processing automatically levels and re-equalizes its input to the "major-market" standards expected by the mass audience. Broadcasters have known for decades that this polished, produced sound attracts and holds listeners, and Orban has long been the number one vendor of stand-alone transmission processing to professional broadcasters worldwide. Commercial broadcasters think nothing of spending upwards of $10,000 to sculpt their audio with an Optimod! A broadcaster's revenue depends on audience share, and broadcasters know that compromising their processing is false economy. Now, thanks to Optimod-PC, a netcaster who wants to maximize audience no longer has to make do with toy processing, ineffective CPU-hungry plug-ins, and inappropriate recording studio plug-ins. Optimod-PC offers full broadcast-quality Optimod processing on a PCI card ? an economical, space-saving alternative to conventional stand-alone boxes. But thanks to its tight integration into the PC, Optimod-PC offers more features than any stand-alone processor. Among others, these include two digital inputs with mixing of asynchronous sources, and sound card emulation that allows Optimod-PC to talk through the operating system to applications running on the host. Digital mixing is crucially important to a netcaster who needs to control commercial content and insertion. 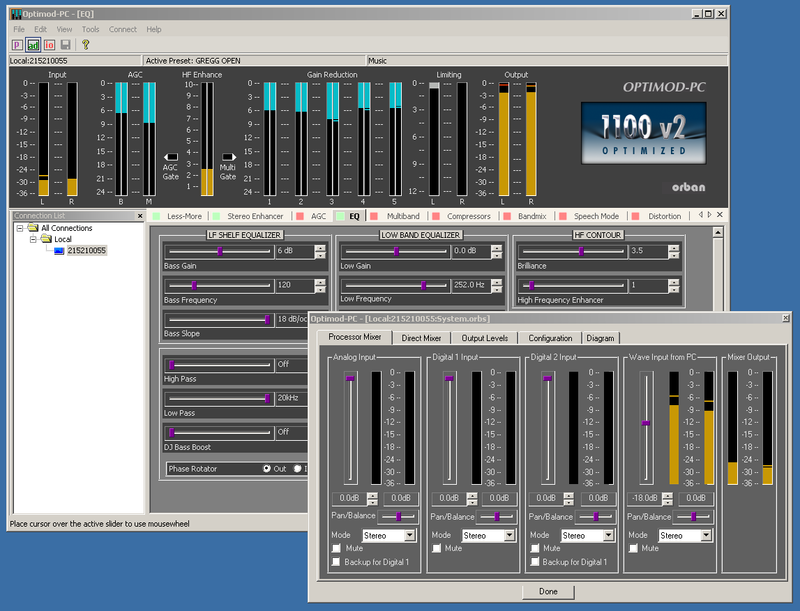 Unlike most sound cards, Optimod-PC allows you to mix an analog source, two digital sources, and your computer's WAVE bus. For example, you could run a playout system on your computer while using the three hardware inputs for a live mic feed, commercial insert, and network insert. In most cases, an external mixer isn't needed, making Optimod-PC a more economical system solution than a low-priced sound card combined with a bunch of external hardware. Optimod-PC comes with over 30 great-sounding presets that make it easy to create a sonic texture that's just right for your target audience. If you want to customize a preset, you can start with an easy LESS-MORE control, and, if that's not enough, tweak over 50 parameters to hone your sound to perfection. Optimod-PC's deep interface will never hold you back as your processing expertise increases, yet its carefully crafted design insulates you from the details if you need great sound right now. An "Optimod on a PCI card"- low cost and high performance from the leader in on-air signal processing used by commercial and non-commercial broadcasting worldwide. Processing designed for digital media using no pre-emphasis, including digital radio, IBOC, two-channel digital television, and webcasting. Creates the polished, professional sound of "big-time" radio broadcasting. Multiband AGC and compression achieve punch, consistency, and loudness. Versatile equalization fine-tunes spectral texture to let you achieve a signature sound for your digital broadcast or webcast. Advanced "look-ahead" limiting with very low overshoot prevents overload of the sound card or encoder while ensuring high loudness. Works in any 100% IBM-compatible Pentium II or better PC with PCI slots. Ideal for systems using perceptual codecs: Optimod-PC’s look-ahead limiter doesn’t produce extra bit-wasting grunge (as do simple clippers), so every bit in your data stream is productively used to encode the desired audio. Over 20 factory presets (each adjustable with easy LESS/MORE control) allow immediate, effortless setup for any programming format. Sound is customizable to almost any degree desired with dozens of controls for fine-tuning texture, dynamics, and equalization. On-board DSP minimizes CPU load—all audio processing is done on the card. As many cards as available PCI slots, including PCI expansion devidces, can be used on one computer. A fast computer can therefore run up to as many encoders and support up to as many stereo streams as the CPU is capable of encoding. Complete remote administration is available over TCP/IP: Adjust and monitor levels, tweak the processor's sound, and save and recall presets. Included software enables the card to batch-process audio files without user intervention. Low throughput delay (less than 30ms) to help preserve lip sync in video streams. Compatible with industry standard encoders such as Microsoft Windows Media Encoder, RealNetworks RealSystem Producer, Apple QuickTime, MP2/MP3, and OEM applications. Drivers for Microsoft Windows 2000/XP. Optional cable assemblies with a DB-25 connector and terminated with XLR connectors or unterminated are available. Optimod-PC uses advanced "look-ahead" limiting with very low overshoot, effectively preventing clipping in the sound card or encoder overload. "Look-ahead" limiting technology automatically produces maximum loudness with minimum side effects. Unlike clipper-based peak limiting, look-ahead limiting doesn't generate extra spectral "junk" that wastes precious encoder bits in the lossy codecs universally used in digital transmission. It's the ideal way to perfect your sound for any digital audio, streaming audio, or audio-over-IP application. Optimod-PC ships with over 20 factory presets (each adjustable with easy LESS/MORE control), allowing immediate, effortless setup for any programming format. It includes an interface for complete remote administration over TCP/IP. You can adjust and monitor levels, tweak the processor's sound through a versatile user interface, and save and recall presets. It also includes software that enables the card to batch-process audio files without user intervention. On-board DSP minimizes CPU load. By comparison to processing running on the computer's CPU, Optimod-PC's built-in DSP allows several streams from a single computer, and minimizes signal delay to help preserve lip sync in video streams. Multiple cards can be used in a given computer or PCI expansion chassis, which is useful in multi-program environments like a Eureka-147 multiplex or large encoder farms. Optimod-PC is compatible with industry standard encoders such as Microsoft Windows Media Encoder, RealNetworks Real/Helix Producer, Apple QuickTime, MP2/MP3, and OEM applications. Optimod-PC a WDM driver for Microsoft Windows 2000/XP, and a networkable control/mixer application. Optional cable assemblies with a DB-25 connector and terminated with XLR connectors or unterminated are available.